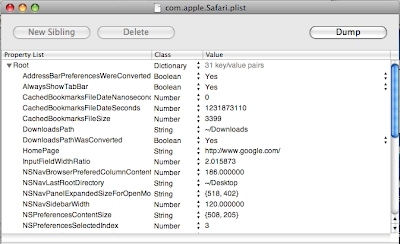 What the F&*#% is the matter with the Safari dev team? I wish someone could explain to me the bonehead thinking that went into the most recent version of Safari. Don't get me wrong, I love Safari. It's fast, it's stable. It renders beautifully. And I very nearly forgot how full-on retarded a fresh install of Safari is to use. I recently had to exchange my normal MacBook Pro for a loaner MacBook to get some servicing done on the former. Using a loaner machine isn't a terribly big deal for me - most of what I do day to day persists remotely, so making the temporary switch is pretty simple. Except for Safari. I mean really, WTF? This is nearly fundamental to the web browsing experience, and the "geniuses" at the Safari team left it off the default UI. You can of course edit the preferences and add a home button (which I promptly did) - but really. Not putting it on there is simply ridiculous. I can understand letting advanced users take it off, but a novice user really needs it to be on by default, not off. Anyway, my favorite part is - the instructions are on the web page you are reading. Presumably you are using Safari of course (if you were using Firefox, you wouldn't really care about configuring Safari, right?) You have to quit Safari to execute the list of instructions. Forget remembering them - they aren't trivial. So you've got to cut and paste the instructions somewhere else just to run them, or launch Firefox (and by the time you do that, I would guess 1/2 of you would just give up and use Firefox and forget about customizing Safari. I don't blame you). 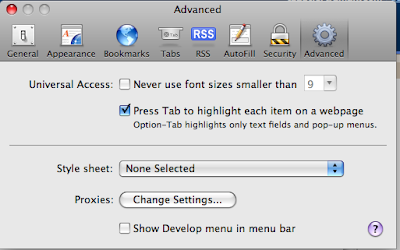 Amazingly, it's even worse - this preference actually existed in Safari 2, but disappeared in 3. Ok, so maybe the Safari team is deprecating the feature - I guess - but why? It's a really good feature to have - for one thing you can't "drag" a window that has only one tab in it to another window (no tab to drag) which I like to do a lot to cut down on extraneous windows (see Item #3). More than that, having the tab bar visible is a good UI affordance, if the Safari team doesn't know about affordances they have some studying to do. This is yet another baffling decision - the feature is available. But you can't set it. Unless you find some web page that gives you a labyrinthine set of instructions on how to set it. Actually, this is a really easy preference to change - but this time, you have to use the terminal app. You know, cuz one way of setting hidden settings isn't enough - you gotta have two! So if you want to enable Safari links to be opened in a new tab, regardless of the setting the stupid web developer that thinks they should open in a new window used, you can find out how to do so here. Nice. Thanks. 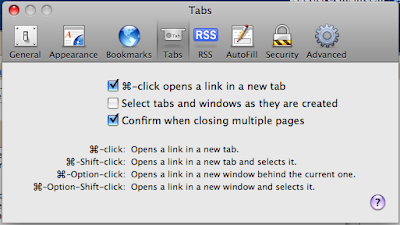 Would it be that hard to just give me a checkbox in the tabs preference pane Safari team? Ok, another big WTF. What else should tab select? This is just silly that it does anything but select the next item in the web page. You know, you're filling out a form, you put in your name or whatever, hit tab to go to the next form field, and blam, the focus is off in never never land. I can't believe that anyone would actually expect that to happen, not after 10+ years where the tab key is pretty the defacto standard for moving the focus - or maybe I'm just windows centric I dunno. Still, this just seems ridiculous to have set to anything but turned on, and yet amazingly enough, there it is, in the advanced section of the preferences pane no less, you've got to check the box to enable what seems like defacto standard behavior. Let's hear it for John McCain! !